With all the holiday planning and prepping this week, it may not be as easy to get away for a night on the town...but that doesn't mean you shouldn't hang out together. 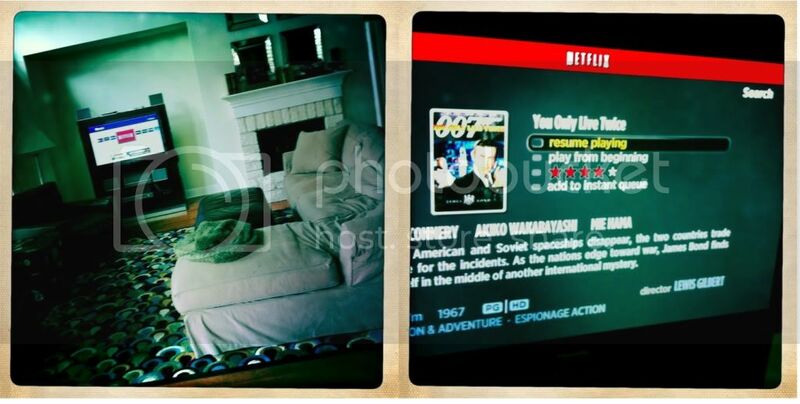 On nights when we can't get away, but just want to chill together we look to Netflix Instant Streaming for help. Lately, when we have had some spare zone out time together, we have been watching the James Bond Film Series from the beginning. Yep - that means we have started ourselves down the path of a 23 movie commitment. Who was your favorite Bond? We recently watched the "Firefly" television series on Netflix streaming. It was fun to look forward to watching it together, and we had a marathon for a couple of weeks in a row. We were sad when we had watched them all! And oh, the best Bond by far is Sean Connery...although Daniel Craig has turned out to be a close second! Dave and I have suddenly become hooked on FlashForward. Each show ends in a bit of a cliff hanger so whenever we've got a free night after the boy's in bed we practically just look at each other and nod.